Mother’s Day is right around the corner! It’s time for us to start thinking about how to celebrate our moms. They really are quite awesome, aren’t they? They clean up after us when we are sick while never having a “sick day” of their own, they always laugh at our jokes, no matter how bad they are (and sometimes they are really bad), and in our younger years, they sang amazing renditions of “Twinkle Twinkle Little Star” while simultaneously reminding us that there’s no such thing as the monster under the bed. 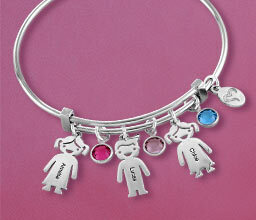 Personalized jewelry makes a perfect gift to show your mom how much you love and appreciate her. All girls remember trying on our moms’ heels and aspiring to have fabulous shoes like those in our own closets! As we got a bit older, our moms tried to buy us clothing in the latest styles, and even when we didn’t like it so much, we knew that it was the thought that counted while we perhaps held onto the secret hope that she kept the receipt! Moms always try to look their best as well, and of course we understood that they didn’t purposefully embarrass us by choosing things that might not have been quite our style. 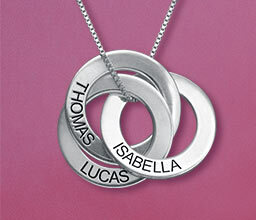 Why not thank her by making her wardrobe extra special with a personalized mother necklace to complement her favorite outfits? Every Mom is a Superwoman! While planning your wedding or birthday, mom simultaneously handled the laundry, chatted on the phone, cleaned the house, and watched her favorite TV show, all while adding to the weekly grocery list so conveniently held in her memory. Whatever you needed done, mom took care of right away – and if you ask her to, she’ll continue to help you even though you’ve left the nest. The extra ingredient? It’s called love – and it makes those cookies all the tastier. If you’re lucky enough to be there, she’ll even let you lick the bowl. Speaking of those sweet, round morsels of chocolate chippy goodness, why not treat mom to a circle pendant necklace. It’s a nice way to say thanks for all the TLC she gave you over the years. Moms are always ready to soothe hurt feelings, kiss bruises, and patch up little cuts and scrapes. Whether you’re 5, 12, 26, or 32, your mom has the power to help you feel better. When you come home from university for the weekend or pop by for a quick visit, mom loves to treat you to your favorite foods! Come hungry, because she loves to see you enjoy the wonderful meals she makes. Moms always let us store our spare “junk” in their homes. Those articles of clothing, pieces of jewelry, and various knick knacks you don’t want to take with you but don’t want to give up, she will happily store on your behalf. Of course, she may jokingly ask you from time to time when you’re planning to pick up your stuff! Treat her to photo jewelry and don’t be surprised if she happily keeps your childhood bedroom ready for your visits. No one has a better ear to listen to your complaining than your mom! Whether it’s about a bad birthday present your boyfriend gave you, horrible grades on a report, or the fact that you didn’t get a raise at work, she will always listen and give you the advice you need on what to do next. Moms Make Laundry Smell Amazing! How do they do it? We’ll never know – but if you don’t want to do laundry while at university, you can always take it home to mom. She may complain about doing it, but in truth she’s happy for an excuse to see you. You might worry about your looks, but mom loves you just the way you are. Of course, she’ll always be honest if something you are wearing isn’t quite flattering, or if a new hair color just isn’t right for you. There’s no better reason than that! Your mom is the best – and with all she has done for you (and all the things she continues to do), she deserves some pampering this Mother’s Day! 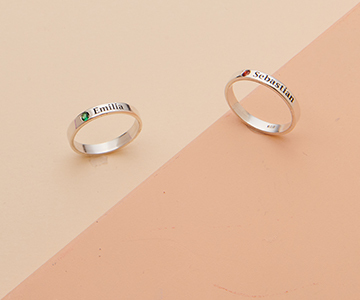 Whether it’s with a beautiful, sparkling birthstone necklace or trendy, go-with-everything stackable mother rings, she’ll appreciate your thoughtfulness. Who knows? You might even be rewarded with a fresh batch of your favorite chocolate chip cookies!